In the recent Frontline documentary “Generation Like,” Doug Rushkoff lamented that today’s youth don’t even know what the term “sell-out” means. While this surprised Rushkoff and other fuddy duddies, it didn’t make me blink for a second. Of course this term means nothing to them. Why do we think it should? The critique of today’s teens has two issues intertwined into one. First, there’s the issue of language — is this term the right term? Second, there’s the question of whether or not the underlying concept is meaningful in contemporary youth culture. My cohort grew up with the term “dude” with zero recognition that the term was originally a slur for city slickers and dandies known for their fancy duds (a.k.a. clothing). And even as LGBT folks know that “gay” once meant happy, few realize that it once referred to hobos and drifters. Terms change over time. 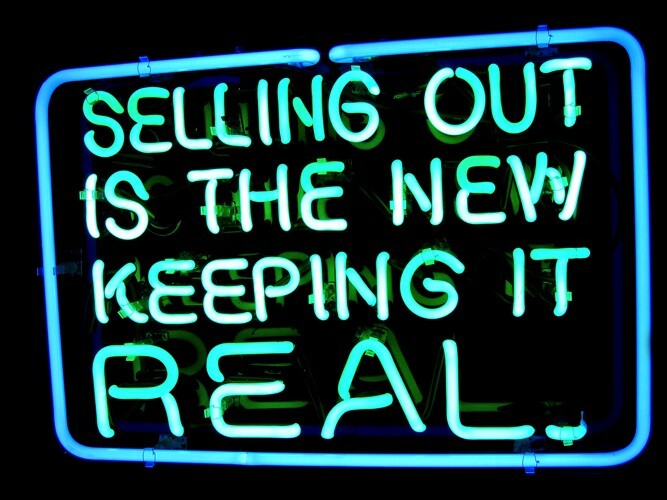 Even the term “sell-out” has different connotations depending on who you ask… and when you ask. While it’s generally conceptualized as a corrupt bargain, it was originally of political origins, equivalent to traitor. For example, it was used to refer to those in the South who chose to leave the Confederacy for personal gain. Among the black community, it took a different turn, referring to those African-Americans who appeared to be too white. Of course, the version that Rushkoff is most familiar with stems from when musicians were being attacked for putting commercial interests above artistic vision. Needless to say, those who had the privilege to make these decisions were inevitably white men, so it’s not that surprising that the notion of selling out was particularly central to the punk and alternative music scenes from the 1960s-1990s, when white men played a defining role. For many other musicians, hustling was always part of the culture and you were darn lucky to be able to earn a living doing what you loved. This doesn’t mean that the music industry isn’t abusive or corrupt or corrupting. Personally, I’m glad that today’s music ecosystem isn’t as uniformly white or male as it once was. All that said, why on earth should contemporary adults expect today’s teens to use the same terms that us old fogies have been using to refer to cultural dynamics? Their musical ecosystem is extraordinarily different than what I grew up with. RIAA types complain about how technology undercut their industry, but I would argue that the core industry got greedy and, then, abusive. Today’s teens are certainly living in a world with phenomenally famous pop stars, but they are also experiencing the greatest levels of fragmentation ever. Rather than relying on the radio for music recommendations, they turn to YouTube and share media content through existing networks, undermining industrial curatorial control. As a result, I constantly meet teens whose sense of the music industry is radically different than that of peers who live next in the next town over. The notion of selling out requires that there is one reigning empire. That really isn’t the case anymore. Of course, the issue of slang is only the surface issue. Do teens recognize the commercial ecosystem that they live in? And how do they feel about it? What I found in my research was pretty consistent on this front. Today’s teens are desperate for any form of freedom. In a world where they have limited physical mobility and few places to go, they’re deeply appreciative of any space that will accept them. Because we’ve pretty much obliterated all public spaces for youth to gather in, they find their freedom in commercial spaces, especially online. This doesn’t mean teens like the advertisements that are all around them, but they’ll accept this nuisance for the freedom to socialize with their friends. They know it’s a dirty trade-off and they’re more than happy to mess with the data that the systems scrape, but they are growing up in a world where they don’t feel as though they have much agency or choice. These teens are not going to critique their friends for being sell-outs because they’ve already been sold out by the adults in their world. These teens want freedom and it’s our fault that they don’t have it except in commercial spaces. These teens want opportunities and we do everything possible to restrict those that they have access to. Why should we expect them to stand up to commercial surveillance when every adult in their world surveils their every move “for their own good”? Why should these teens lament the commercialization of public spaces when these are the only spaces that they feel actually allow them to be authentic? It makes me grouchy when adults gripe about teens’ practice without taking into account all of the ways in which we’ve forced them into the corners that they’re trying to navigate. There’s good reason to be critical of how commercialized American society has become, but I don’t think that we should place the blame on the backs of teenagers who are just trying to find their way. If we don’t like what we see when we watch teenagers, it’s time to look in the mirror. We’ve created this commercially oriented society. Teens are just trying to figure out how to live in it. Thanks to Kate Lee, Anil Dash, Clive Thompson, Quinn Norton, and Craig Mod.